Murata Juko created “ro”(winter style. 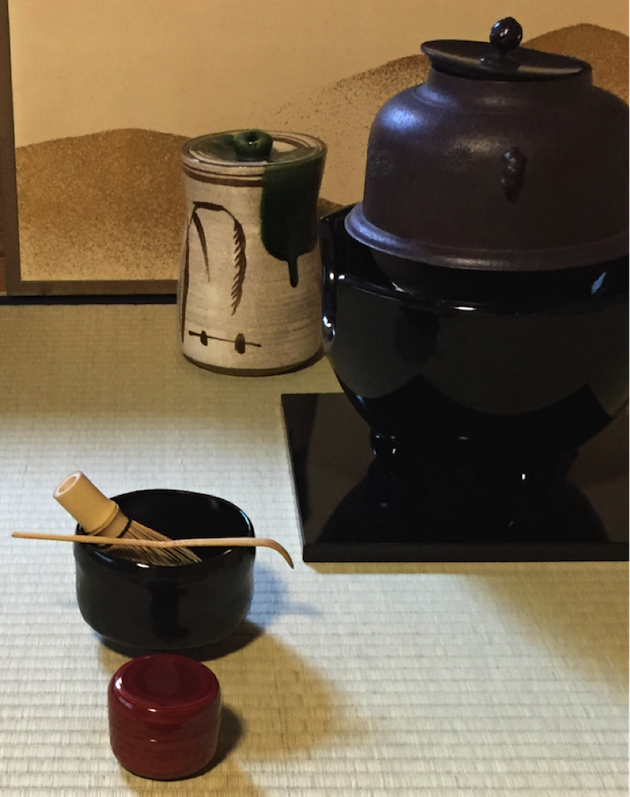 The iron kettle is in the square hole in tatami), and Sennno Rikyu perfected the way of tea. Before that, only “Furo”, summer style was used in all seasons. We can use “Furo” style in winter. In case we do not have “ro” on tatami, but it will be more enjoyable and seasonal to see “ro” in a tea room. We usually use “Furo” from May to October, “Ro” from November to April. Closing the square hole “ro” at the end of April or on May 1st, Furo season starts. The vase made of weaved bamboos is suitable for this season. We often put white hibiscus and thin leaves of Japanese pampas in it. The incense box is made of wood, where we put wooden incense tips. Talking about seasonal utensils, we enjoy the signs of iris, Kabuto(war helmet for samurai) in May, when we celebrate the healthy growth of boys. In June, we can see fireflies and hydrangeas on tea utensils, and start using flatter tea bowls to feel cooler in hot & humid season. From the end of August, we gradually feel the beginning of the autumn. We often put Japanese pampas with ears in September. The full moon, ears of pampas grass, and rabbits we think of them living in the moon are the image of September. Naka means in the middle, Oki means putting. It is the special style of the tea room only in October. We put an iron kettle in the middle of tatami mat, and use a thin fresh water container to put it on the left side of the kettle. 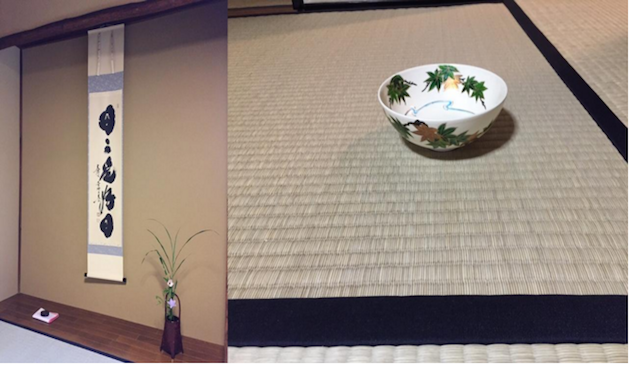 I use thin water container with Oribe design (deep green color and geomatics’ patterns) on it in Tea Ceremony Koto. We have an iron kettle on the left side of tatami from May to September, so the fire will come closer to the guests to keep the room warm. It is said that modest designs are more suitable than pretty gorgeous ones, especially for Nakaoki. We open Ro at the end of October or November 1st. Ro is the square hole in tatami where we put an iron kettle to keep the room warmer in winter. Set a square flame in tatami, the size of the kettle and a bamboo ladle become bigger than Furo style. Soft incense is in a small incense box made of pottery. We do not use a vase made of weaved bamboo in winter, but vases made of cut bamboo or simple potteries such as Bizen(pottery in Okayama prefecture), Iga(pottery in Mie) or Shigaraki (pottery in Shiga next to Kyoto) are suitable to put camellia in Ro season. Talking about typical seasonal designs, we often see red maple leaves or yellow ginkgoes in November. In December, we often see the calligraphy written by Zen Buddhism priest “Time and tide wait for no man”, from which we feel the end of the year. Nowadays, we also have Christmas designs. To celebrate a new year, signs of the Chinese zodiac, various treasures, and pine trees are used for tea utensils. In addition, we use deep tea bowls to keep tea warmer in cold winter. Goblins & happiness for Setsubun in February 3rd, Hina dalls, Japanese table lamp with a paper shade, diamond rice cake for girls’ festival in March 3rd, varieties of cherry blossoms in April. We are looking forward to see the utensils in the tea ceremony. It’s not too much to say that feeling season is one of the most important themes for us. Maybe most of the guests from foreign countries are “once in a lifetime” meeting in Tea Ceremony Koto. The guests might not notice even if I use same style of the tea room Furo, and all same utensils through the year. But I would like to welcome all the guests including foreign tourists with seasonal tea utensils or sweets to share Japanese four seasons through tea ceremony. I welcome any questions about traditional tea utensils in the session.